Much can happen in one hundred years. Technology changes, cities change, and people change. And throughout these years of change and growth, there are threads of uniqueness and constancy that remain - threads of legacy that are woven into the fabric of a city and a society. These strong threads of legacy are what we have sought to present in this exhibit. What is Charlotte's legacy? This is the question that the Library staff and the curators of this exhibit faced as we began our Celebration of Legacy in 1999. Many common themes came to mind immediately: textiles, tree-lined neighborhoods, Charlotte's own gold rush, banking and much more. 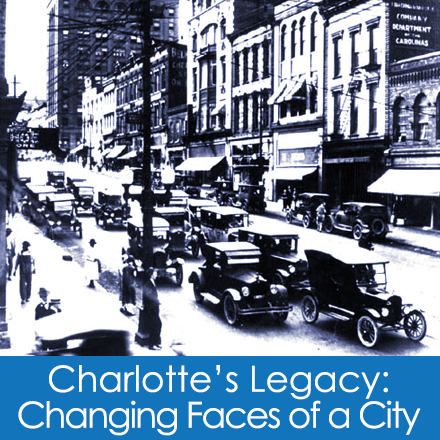 But we decided to go deeper, to look at aspects of Charlotte's past one hundred years which linger today and bring a special sense of history, growth and pride--aspects which blend the desire for change and growth while honoring the city's past. Guess Where This Is Now?